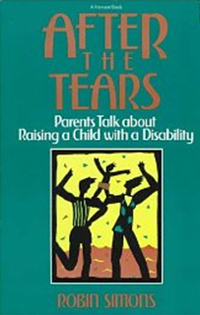 Robin Simons is the author and co-author of seven books, including Recyclopedia: Games, Science Equipment, and Crafts from Recycled Materials (1976) and After the Tears: Parents Talk about Raising a Child with Disability (1987). A reader describes After The Tears as "an honest, informative and poignant collection of experiences of families whose lives have been changed by a family member with a disability. This is a great resource for families and a MUST read for professionals and para professionals." Together with David Calof, Simons also wrote The Couple Who Became Each Other: Tales of Healing and Transformation (1996). The book uses real stories to demonstrate the use of hynotherapy as an approach to healing.